Kerry Clare is a National Magazine Award-nominated writer whose essays, reviews, and short fiction have appeared most recently in The Globe and Mail, Chatelaine, and Joyland. She is also the editor of and a contributor to The M Word: Conversations about Motherhood. She teaches The Art of Blogging at the University of Toronto and writes about books and reading on her website, Pickle Me This, as well as at the book website 49thShelf. 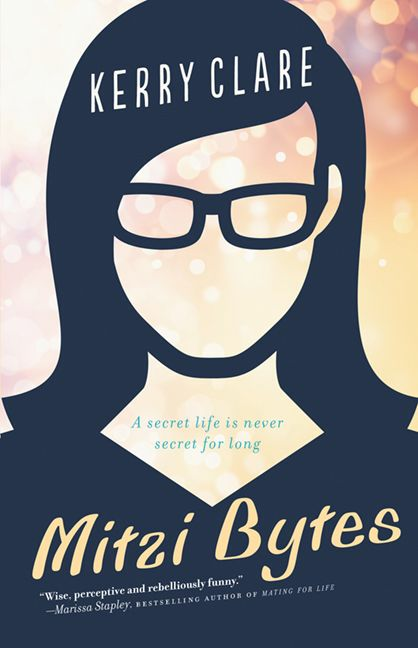 In her debut novel, Mitzi Bytes, Clare crafts the story of Sarah Lundy, a mother and writer whose secret identity as an anonymous blogger is threatened with exposure. Clare brings her background and observations as a mother, reader, writer, reviewer, and blogger to her novel, allowing for a smart and funny exploration of identity, relationships, and modern life in the online age. In a conversation with Ann Cinzar, Clare talks about motherhood, writing and blogging, and how we all have multiple identities. Ann Cinzar: You've been blogging for many years on your own site Pickle Me This, but Mitzi Bytes is your first novel. I enjoyed how you melded the first person narrative of Mitzi's archived posts into the thoughtful third person narrative of the novel. What was it like writing a novel-length work after years of blogging and doing shorter pieces of writing? Kerry Clare: Mitzi Bytes is my first novel that was good enough to be published and made into an actual book! I think it's actually my fifth novel, but each of those failures was necessary in getting me to the point where I was ready for this book, so I am grateful for them, because I'm really proud of the book. And I do credit my blog with teaching me how to write, both in that airy-fairy "finding my voice" sense and also just practically speaking, in that I learned a lot by sitting down and writing regularly over years and years—that outlet has been essential. AC: When Sarah Lundy began her blog, she wrote about herself and her exploits as a single woman. But when her own stories became mundane, she started blogging about other people with juicier tales to tell. It makes me think about the advice I've heard, that good writing centers on the word "but" not "and." The implication is that it's only when there's conflict that things are interesting. It's like the stable, comfortable life is too boring to live, let alone write about. Isn't that a bit depressing? I mean, are we never meant to be happy? Or even just content? KC: The writer Teri Vlassopoulos posted something about my book on Twitter the other night, and she said I was an heir to Laurie Colwin, which is pretty much the nicest thing anyone has ever said to me. But what meant the most, and what I hope Teri saw in my novel, was the capacity for joy that is there, which is something I really love about Colwin's work and why it inspires me. Sarah really is pretty happy in her life, as I have the great fortune to be in my own—knock on wood! I wanted to write about a happy marriage. I wanted to write a plot that wasn't propelled by the usual twists—infidelity in particular. Unhappiness has become something of a cliché in modern fiction, I think, turning Tolstoy on his head. I continue to insist, in my life and in my fiction, that happiness is a possibility. In Ali Smith's new novel, Autumn, she writes that the person who gets to write the stories gets to make the world, and I think she's right, which is why showing this possibility is powerful and important. But, of course, no one is happy all the time, and life tends to toss a wrench into the best made plans. The darkness is as important as the light is, but the light is all the more notable for the contrast. I think that a happy life can still be interesting. The continuing (relative) popularity of mundane blogs like my own is testament to this. That said, blogs like mine don't get the same traffic as the writers who are train wrecks. Their blogs are more sustainable. AC: Sarah assumes no one will discover her hidden identity as the author of Mitzi Bytes. I was intrigued by Sarah's belief that "few people were wise enough not to be surprised by how they were perceived by the world." I love how this circles back, because while Sarah believes this about other people, she doesn't recognize that it applies to her. Do you think people really are unaware of how they present themselves and how they are perceived? KC: I do, because it's so subjective. We have no idea of the lenses others are regarding us through. But, at the same time, I think Sarah is fooling herself a bit with this assurance, and, with a little imagination, she might be able to suppose how her stories come across to someone else. She just never takes the time to imagine. The danger of the blog is that you always get to be the protagonist. It's easy to forget that other people are telling their own stories, and they're not just actors on your stage. My character struggles with this. AC: You bring up an excellent point: other people are telling their own stories, too. Obviously, though, it's the writers and bloggers who are committing them to paper (or screen, in Mitzi's case). It raises the question faced by many bloggers and writers today, especially in a world where blogs, personal essays, and memoir have become prolific: how much of our stories are our own? And how does one determine what is theirs to share? KC: This question is something I think a lot about, and Mitzi's thoughts in the novel about a mother's right to tell her own story are also mine. There's a lot of posturing that goes on online about mothers' stories and their children's rights to privacy, and I think a lot of what is said is nonsense. When you tell a woman that stories involving her children are off-limits, what you're saying is that these things that happen in her life are no longer her stories to tell. Of course, there are limits to this and a child's dignity does need to be respected, but it's also another way that society tells women to shut up. I take heart from Molly Jong-Fast's essay about how it felt when readers perceived her mother, Erica Jong, as portraying her daughter in fiction and her experience of getting over the notion of being "exploited." I think that as deliberate as parents are in their parenting choices, they're never going to get it completely right, so they might as well have a good time doing it. There are so many useful ideas that can come out of writing about parenting—see Emily Schultz's piece on parenting a child with autism—and so much gets lost when parents start thinking they can't go there. I take for granted that a parent who is writing about a child is writing from a place of love—but also acknowledging that love is messy and complicated and people are imperfect, and there is nothing wrong with that. I pretty much stand by the Anne Lamott quote: "You own everything that happened to you. Tell your stories. If people wanted you to write warmly about them, they should have behaved better." Of course, it's not a blanket statement. All writing should acknowledge complexity. The writing should be good too. But let's trust people to use their own judgement and tell stories as they see fit. AC: The theme of the multiplicity of self is handled so cleverly throughout the book, starting with the fact that Sarah Lundy is living two lives: one as herself and another hidden life as the author of the Mitzi Bytes blog. In the blog, she is free to voice her stronger feelings and opinions about any subject or person (which, of course, is why she may get in trouble if she's discovered!). Do you think in some ways we all live double lives: the people we present to the world and the people we are inside? KC: Yes! And then some, because I think who we are depends even on the weather and the music on your earbuds and whether the traffic happens to be heavy or light. And I think this is more the case for women than men. I am thinking of the physical changes that biology inflicts upon a woman's body as soon as she becomes a woman and how these changes happen throughout her life. Everything is metamorphosis, which is frustrating for the fiction writer or the magazine profile writer, both of whom want to contain reality to the page. AC: As a mother, Sarah's character is recognizable and relatable: that mother who is fully immersed in her children's lives and manages the entirety of her family life. Nonetheless, she has no answer for the question "tell me about yourself," in part because "motherhood was not the answer." So many mothers (myself included) struggle with this notion that they love their children and want to be present for them, but motherhood is not enough. And, yet, despite being conflicted, and despite years of feminism and societal change, they still find themselves consumed by motherhood. Why does it feel like motherhood is all-consuming? KC: I think the big problem is that motherhood is hard to articulate. If I had had any idea of what the realities of having a child were (particularly in the early days), I might never have gone through with it. And, yet, try explaining to someone who hasn't gone through it that all the terrible can totally be worth it—it's hard to fathom. The highs are even harder to talk about than the lows are, really. So that's the challenge when a woman is called to account for herself—and no matter how she answers, she's going to be letting somebody down, whether it's feminism or the children. My character has a difficult time explaining how she spends her time because her principle pursuit (her blog) is a secret, but this problem is one that many women encounter. And we are programmed to tell ourselves that what we give is never enough. I don't think this mindset is inevitable though. Many women successfully meld motherhood with other pursuits and occupations—and most of them have no choice in the matter. The mom guilt/martyr complex can be resisted. So much of that is fed to women rather than something that's organic anyway. AC: As mothers, we're often programmed to tell ourselves that whatever we give isn't enough. At the same time, though, it can feel like we give too much: we give up or change so much of who we are—from careers and relationships with friends and partners to our bodies and mental state. This idea of losing yourself in motherhood ties into the theme of identity in Mitzi Bytes. KC: The multitudinousness of the self is a theme the book touches on over and over, and I think I've written a character who is comfortable with being more than just one thing. In fact, she even insists upon it. (Being honest about embracing all her selves is a huge part of her narrative trajectory, though—she has even more selves than she gives herself credit for.) I don't know that she thinks so much about losing herself in motherhood, though. To be honest, maternal ambivalence itself has become something of a narrative crutch or cliché, and I wanted to write a character who was mostly comfortable with the way that motherhood has changed her life. She likes being a mother, and she likes her children and the richness they bring to her experience—even while acknowledging that there's drudgery, that small children can be exceedingly annoying, and that the labour of motherhood isn't properly valued. But there it is again, the multitudinousness—motherhood, like mothers, is never one thing or another. I actually really admire the way my character never worries that she's not enough—as a wife, as a mother. She does worry, yes, about being seen as "just a housewife," but that's other people's perceptions. She's found fulfilling ways to spend her days. She's really comfortable in herself. And I think we need more representatives of women like that in literature and pop culture. AC: Now that you've published your first full-length work, do you have any tips for anyone hoping to start (or finish!) writing a book when they're used to writing shorter pieces? KC: My advice for anyone contemplating a big project (a novel or a blog) is to just do it. I committed myself to writing 1000 words a day the summer I wrote Mitzi Bytes, which I did while my oldest daughter watched Annie on the couch beside me and the baby napped. That was the same summer I took up jogging—the experiences were analogous. Just keep going, one foot in front of the other. Follow where the story leads you. (It helped that for the first time in my life, I was writing a book with an actual plot.) I ended up quitting jogging after the day I burst into tears in Queens Park because I hated it so much. But with the book I persisted, just getting the words down. Sometimes the words weren't great, but I didn't go back and fix them. They make second drafts for that. With the first draft, the whole trick is just to keep on going forward until you're done. Ann Cinzar writes about family, culture, and negotiating the complexities of modern life. Her work has appeared in The Washington Post, McSweeney’s Internet Tendency, Motherwell and elsewhere. Find her on Twitter @anncinzar or Facebook, or schlepping her kids between Kumon and swim practice. a reviewer of one of my novels wrote about the TV series "Mad Men," noting, with approval, the absence of the usual story arc/conflict/car chases. I'm glad to see a novelist interested in that approach.